If one were to parse the entire pantheon of country music heroes for a quartet that embodies all that is great and good in country music, it would be hard to imagine a line-up more epic than Johnny Cash, Waylon Jennings, Kris Kristofferson and Willie Nelson. It was with this notion in mind that, in 1985, these four legends came together as the made-to-order country supergroup The Highwayman. 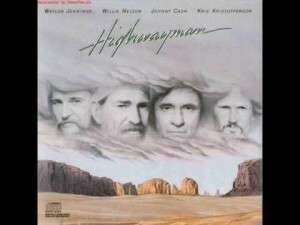 In October 2010, in honor of the 25th anniversary of the group, Columbia released The Essential Highwaymen, a two disc anthology celebrating the best of the Highwaymen as an ensemble. The collection also goes further, however, in offering other noteworthy collaborations between two or more of the Highwaymen as well as solo tracks that highlight the origin and evolution of each member’s distinct musical style. 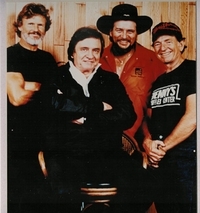 Driven by the star power of the group’s members and the strength of several tracks, “Highwaymen” rocketed to number one the country charts, both as an album and a single. 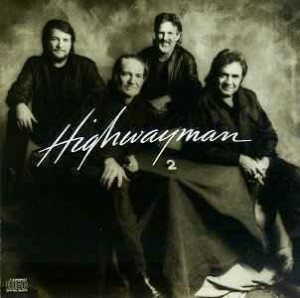 The group’s second album, Highwaymen 2 was released in 1990, ultimately reaching #4 on the charts. It also earned the group a Grammy nomination for Best Country Vocal Collaboration. Five years later, in 1990, they released their final album, The Road Goes on Forever, produced by the legendary Don Was. Sadly, the album fared no better than #42 on the charts. In reviewing an album with 12 or even 15 tracks, it is possible to give at least a little attention to each song on the disc. On a two disc collection with 36 tracks, that is simply not feasible, so this review focuses on the best and most significant songs of The Essential Highwaymen. The shining star of The Highwaymen’s ensemble recordings is, of course, “The Highwayman.” Through the song, the quartet’s magnificent voices trace the evolution of the eternal archetype of the rugged, fringes-of-society individualist through four historical incarnations: European highwayman, sailor from the age of “wooden ships and iron men,” Depression area dam builder and starship captain from the distance future. In addition to its timeless and powerful lyrics, “Highwaymen” is driven by a wild, haunting sound that highlights country music’s roots in Celtic folk music. “Last Cowboy Song,” has obvious musical similarities to “Mamas Don’t Let Your Baby’s Grow Up to Cowboys” Thematically, however, it is in the same vein as “The Highwayman.” Simultaneously proud and sad, its strong lyrics and pinning sound trace the cowboy archetype through history and mourn its increasing absence in the modern world. As well as being one of The Highwaymen’s most beautiful numbers, their rendition of “Big River” is also of note to those interested in the history of country music. Written by Cash and first recorded during his Sun Record days, his original lyrics included an additional verse that was omitted from the Sun release. The verse, however, is included on The Highwaymen recording. Another track of some historical interest is the compilations’ version of “Desperados Waiting for the Train,” a live recording that was the highlight of the 1993 Farm Aid concert. Strong songwriting, this time amusing rather than heartbreaking, is evident in “Backstage Pass,” a number written by Cash telling a tongue-in-cheek story of backstage life for a country musician — while gently poking fun at himself and the other members of The Highwaymen. Within the membership of The Highwaymen, no partnership was more dynamic or prolific than that of Jennings and Nelson. 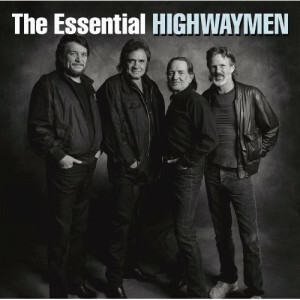 The Essential Highwaymen includes five of their duets, including tracks like a “Mamas Don’t Let Your Babies Grow Up to be Cowboys” and a live version of “Good Hearted Woman,” which showcase the Waylon and Willie partnership at its very best. “How Do You Feel About Foolin’ Around,” a good-old fashioned, up-tempo “easy lovin’” song voiced by Kristofferson and Nelson that includes some fun instrumentation, including piano and trumpet. “There Ain’t No Good Chain Gang” is an equally enjoyable and up-tempo “hard times” number sung by Cash and Jennings. The solo tracks on The Essential Highwaymen represent some of the most recognizable and acclaimed work of the four artists, including Cash’s “Sunday Morning Coming Down,” Jennings’ “Luckenbach, Texas,” and Nelson’s “Help Me Make it Though the Night.” The compilation, however, also includes a number of lesser known but worthwhile numbers. Among the solo tracks in the collection, Kristofferson comes off particularly well. Few would question the greatness of any member of The Highwaymen. Kristofferson, however, is not always mentioned in the same breath as the other three. The Essential Highwaymen is a good reminder of why he should be. As a songwriter, few individuals have influenced American popular music as much as Kristofferson. This collection reminds us that he penned the words and music of the immortal “Me and Bobby McGee” as well as “Sunday Mornin’ Coming Down,” (now best associated with fellow Highwayman Cash) and “How Do You Feel About Foolin’ Around” (largely associated with Nelson). “The Pilgrim: Chapter 33,” less known than many of the album’s tracks, also showcases Kristofferson’s songwriting gifts as he weaves an eloquent and complex tale of a loner and wanderer who has sampled the best and worst life has to offer. The Essential Highwaymen also includes three songs referencing Hank Williams Sr.: Cash’s “The Night Hank Williams Came to Town,” Kristofferson’s “If You Don’t Like Hank Williams,” and Jennings’ “Are You Sure Hank Done it This Way?” It is an appropriate triptych, given William’s role as spiritual godfather to the Outlaw movement and influence on the styles and attitudes of all four artists. Some of The Highwaymen’s artistic output, most notably their version of “Highwayman,” legitimately ranks among the great recordings of country music. At the same time, the group never came close to matching the commercial or critical success that each of its members found individually. It is difficult for a country music writer to speak ill of any of these musicians without expecting a bolt of lighting to come out of the sky and strike him dead. Artistically, however, it is hard to avoid the feeling that many of The Highwaymen’s songs fell short of the pinnacle of which the group should have been capable. Part of this gap stems from a pattern of showcasing each member’s individual talents rather than truly exploring what could be achieved by blending all four talents and styles together. Additionally, Highwaymen recordings have a glossy, highly-produced (and occasionally overly produced) sound that was, ironically, anathema to the grittier, personal, and more authentic style that helped make each artist popular as individuals. As a possible final factor, in the post-Highwaymen era, comments have been made suggesting that egos of the individual stars involved may have prevented the project from ever reaching its full potential (though, it should be noted, there are also quotes and comments to the contrary). If that is true, then the bittersweet sound characterizing much of their music also characterizes the group itself –- an ensemble the likes of which we will never see again and which could have been much more, but leaves us still grateful for the wonderful music they recorded. Fortunately, “The Essential Highwaymen” showcases and preserves all that was best and most enduring in the group’s oeuvre. At the same time, by preserving other great collaborations between its members and showcasing the distinct origins, style, and talent of Cash, Jennings, Kristofferson and Nelson individually, the collection is must-own for any serious student of country music history. This men rule. They influenced more musicians then the rest in rock or pop.